When is that event I heard about at Mass? If interested in becoming Catholic a good way to learn more is to come to our Catholic Conversations which is an informal meeting of both information-seekers, those new to Catholicism and Parish Faith Formation leaders. Catholic Conversations meets every Sunday after 10AM Mass in the Parish Center Library. Ask an usher at Mass where this is located. Contact the parish office to make an appointment with Father. (206)363-6767 Also, for more information please click here. How do I get my baby baptized? How do I set up my online donations? To set up an account click here. If you need help please contact the Parish Office by clicking here. How do I reserve a room for my meeting? Please submit a request through the parish webpage here. 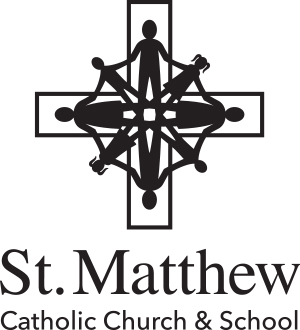 Please be advised that St. Matthew Parish and School events will have priority. Communion is for Fully-Initiated-Catholics who have received their First Sacraments (Baptism, 1st Communion, and Confirmation). Fully-Initiated-Catholics, who are not conscious of grave sin, and who have fasted for at least one hour. How can I put my child into the School? Visit the school webpage to learn more. Call the school office to speak with the principal to arrange a tour and a meeting. Can the Church give me some money or food? St Matthew is blessed to have a very active St. Vincent de Paul Conference. Please first go through the downtown SVDP intake center by calling (206) 767-6449. While the assistance is not immediate, SVDP can offer help with groceries, rent and utility bills.